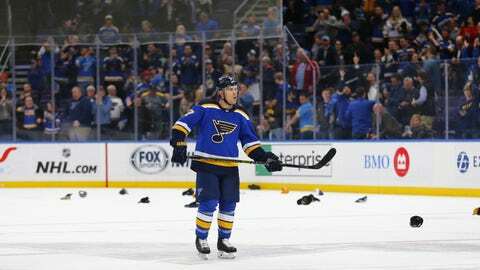 Jaden Schwartz scored once in each period for his fourth career hat trick and first since Oct. 18, 2017, against Chicago. ST. LOUIS — Goals have been hard to come by this season for St. Louis Blues left wing Jaden Schwartz. That all changed Tuesday night against Edmonton. Schwartz opened the scoring at 11:41 of the first. He got the puck in the corner, skated into the left faceoff circle and lifted the puck from a bad angle over goalie Mikko Koskinen‘s glove. NOTES: Blues RW Vladimir Tarasenko returned to the lineup after missing five games with an upper-body injury sustained March 7 against the Kings. Without him, St. Louis was 1-2-2. … Connor McDavid had his streak of eight consecutive multipoint games snapped. McDavid remains three points shy of tying his career high of 108, set last season. … St. Louis won the season series 2-0-1. … Edmonton fell to 16-17-5 on the road. … Binnington improved to 14-3-0 in his past 17 starts.